I swear I’m not going to read another World War II book for the next seven years. With Alone in Berlin, The Boy in the Striped Pyjamas, Making History and The Postmistress, I think I’ve pretty much Hitler-ed myself out. Still, it’s been interesting to read accounts from different perspectives – we’ve had a narrative from a little German boy, an American journalist, an English modern scientist, and now a contemporary account from a German war-opposer. Firstly, this is a slow book. I was probably at least 2/5 of the way through before I really started to get into it. It has a slow beginning, as a multitude of different characters are introduced without really showing us how they inter-connect or what relevance they have. Stick with it. After a while, you really start to understand the characters and how the oppression present in Nazi Germany affects them all differently. For me, the turning point was when I read the Afterword. In certain cases, Afterwords affect a reader’s view the book to such an extent that they should really put it at the beginning. I only came across it when I was skipping forward to the end of the story (I know, I know – I’m one of Those People) and flicked through it. 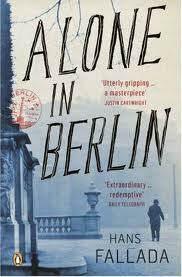 Previously, I thought that Alone in Berlin was a relatively modern novel, but it’s not at all. Hans Fallada lived in Germany during the Nazi regime (well, he didn’t, because that’s a pen-name, but you get the idea) and was unfairly denounced as an anti-Nazi conspirator. An earlier work of his, The World Outside, was condemned as being too sensitive to convicts and he was forced to alter many of his other novels. At the back of Alone in Berlin, there are photographs of the prison documents used to convict the real people these characters were based on. So, I didn’t ‘get it’ until I read the after-word; now I do, and I think it’s wonderful. It’s not just a mundane account of the day-to-lives of generic workers; it’s more than that. It’s about how the Nazi propaganda was so powerful, so brainwashing, that even the slightest rebellion from inside Germany was quashed, and even the smallest insurgence was dealt with as harshly as possible. No-one would stand up and fight against Hitler, because they were too scared of recrimination. Otto and Anna’s fight against the Nazis in Alone in Berlin signifies how useless any fight would be and how in the end, it was foreign powers that ended the disgrace, not the German workers. Trust me, I hate that I had to read the afterword to understand the entire point of the book. But hey, I can live with that – I can suffer the indignity of admitting my ignorance because it allowed me to get everything I could from the novel. It’s not an easy book to read, but you’ll be rewarded if you do. The characters are so full and so lively, that it’s easy to see that the author based them on real people. They’re not all likeable (in fact, very few of them are) but that adds to the reality of it. Some people are trying to do what they think is right – either by keeping their heads down or fighting the power, but some are out to gain from the misfortune of as many people as possible. I really, really enjoy it when I end up liking a book a lot more than I expected to. It feels like I’ve somehow broadened my horizons and made a new friend. I'm featuring World War II fiction right now…well kind of. Reviews and giveaway. I don't think I usually read them in a row so I can understand if you get a bit burnt out. I think there are so many better ones out there though. I agree this is not an easy book to read, but I'm so glad I read it too. There is an awful lot of World War II fiction around at the moment. Great review. I tend to avoid WW2 fiction, actually. I know a lot of its great, just tends to be a bit heavy for me.